Puddings are hard if you are dairy/egg/nut free. There isn’t much variety that you can buy ready made (think soya yogurt/pudding variations) and most of the puddings people love are laden with dairy and/or eggs – that is after all where they get a lot of their wow factor from! 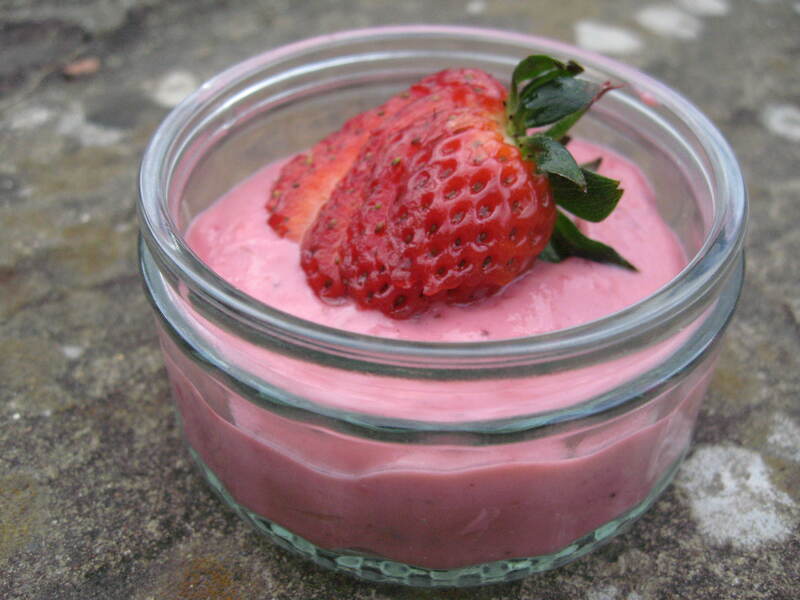 This mousse is a fabulous recipe – packed full of flavour and fairly ‘moussey’ – it would certainly please even the most confirmed vegan-phobe! It’s inspired by a recipe from The Enchanted Broccoli Forest by Mollie Katzen, another veggie cookbook that’s well worth owning. It works brilliantly with any berry (although you may want to sieve out the seeds from raspberries) and although I haven’t tried it yet, I’m sure any soft fruit would work well too. Big S loves this one! – Pour into a bowl. Using the same saucepan (no need to wash out) add the sugar, lemon juice and cornflour. Whisk over a low heat until smooth and lump free. – Pour the strawberry ‘soup’ back into the saucepan. Whisk over a medium heat until thick and jammy. – Pour back into the bowl and place in a fridge to cool and set. – Once cold, puree with a hand held blender until smooth. – Whisk in the soya yogurt. Pour into four ramekins and chill. Decorate as desired. This looks just too delectable! Wonder if I can substitute coconut milk yogurt for soy yogurt. Any thoughts? I had the same question about coconut yogurt since we can’t have Soy…I’d be ver inerested in the follow-up if it worked. This looks amazing and I’m book marking this! You last several recipes posted have looked great! I just have to start feeling better so I can start trying out new things again. Looks sooo yummy. I really want to try this (have tried a few of your recipes and they were all great) but do you think it will work with oat cream instead of soya yoghurt?